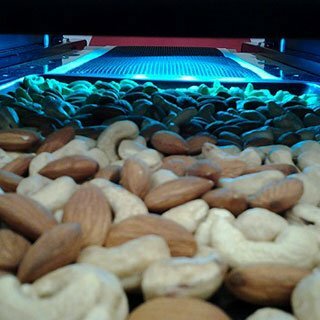 Technilamp offers a range of UV-C Conveyer systems that provide UV-C disinfection on the top and bottom of the conveyor. We offer both off the shelf solutions and specialised conveyer systems that can be designed according to customers specific requirements, including the design and manufacturing of the control panel. The UV-C systems can be designed either for disinfection at the time of pre-packaging, during the actual packaging process or prior to sealing of the contents. UV-C ideally replaces chlorine when washing and sterilising smooth surface fruits such as berries. Also packaged ready-to-eat cut fruits such as those found in retail stores. UV-C germicidal technology can be used in the complete processing process, from replacing chlorine in water to sterilisation of the fruit and sterilisation of the packaging. 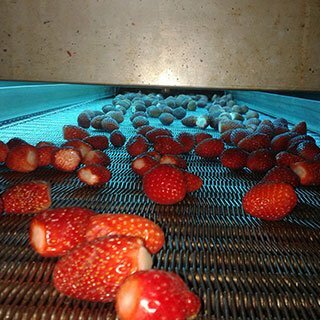 We have completed automated conveyor projects for fruit companies that supply the major retail chains in South Africa and the UK. Our UV-C systems sterilize the air in the spiral coolers of large commercial bakeries. This greatly assists with the prevention of mould growth and extends the products shelf life. 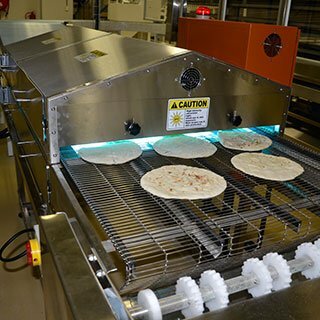 The UV-C systems have also been designed to disinfect bacteria on specialists ethnic bread lines such as Pita Breads and croissants. Coil drying and moisture free system. Each system is custom designed according to coil and duct size. Delivers a continuous 24/7 dry, moisture free coil for free air flow. UV-C is very efficient in killing bacteria in meat. 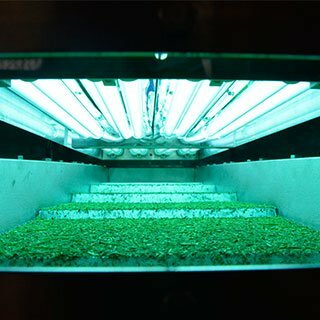 We offer a unique combination of UV-C and Ozone which kills bacteria and prevents the spoilage of meat surfaces. Research undertaken in Australia has confirmed that the unique combination of UV-C and Ozone extends the shelf life of hanging meat from 11 to 22 days. The systems can be installed in the cool room system at the time of construction or retrospectively. The disinfection of cheese and dairy products. The disinfection of surfaces and the prevention of smells. The disinfection of packaging containers such as boxes, caps, bottles, cartons, tubes, films and foils. You have the opportunity to take advantage of environmentally friendly, low maintenance, cost effective, UV-C products and services from the team at Technilamp. Improve the efficiency and drive up the profits of your company. Ultra-Violet C is an invisible spectrum of light that will eliminate viruses, bacteria, moulds and odour on surfaces, by penetrating their membranes, attacking their DNA, preventing them from replicating and killing them instantly. Due to the growing demand from international and local retailers and their consumers for environmentally friendly and chlorine-free products, the use of UV-C technology in the disinfection of fruit, vegetables, nuts, meats and bread has increased substantially of late. No other technology has the capability, the adaptability and the favourable cost economics to control bacteria in the food chain. Bacteria is airborne and difficult to control. The use of UV-C technology provides the added boost of safety and disinfection over a spectrum of all food to food processors and customers alike. This is done at the most important points of the production process, thereby providing added protection and confidence.